Who opened Tedworth property accounts in New York? When the Task Force on Corruption during the Levy Mwanawasa era confiscated property belonging to Access Financial Services and Tedworth properties, a lot of suspected plunder and theft took place by officials of the Task Force and the Bank of Zambia. One issue that has just emerged is that there was an offshore account opened in New York under the name Tedworth Properties Limited. This account at Citibank in New York is mysterious because, Faustin Kabwe and Aaron Chungu have all said they never opened accounts outside Zambia and that all their accounts were in local Zambian banks. Another interesting aspect is that the account in New York is in the name of Tedworth Properties limited while the company Chungu and Kabwe operated was called Tedworth properties incorporation. One of the properties that was under Kabwe’s Tedworth properties incorporation was the building that houses the UNHCR offices in Lusaka. 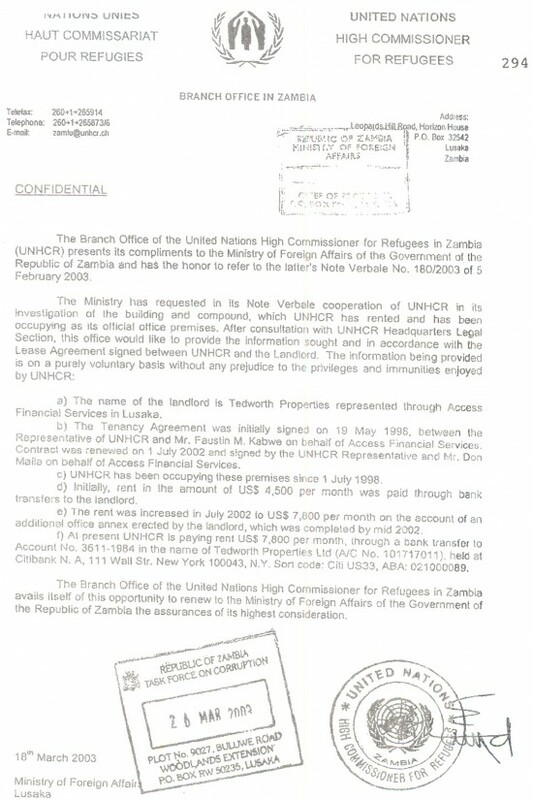 Documents show that UNHCR entered into a lease agreement for the Tedworth Property through Access Financial Services in 1998. The agreement was signed by Faustin Kabwe. But somehow and sometime in July 2002, the rental amount was increased from $4500 to $7800. And UNHCR was directed to start paying this monthly sum to an account at Citibank in New York. At the time these changes were made, the properties were already confiscated by the Task Force and Bank of Zambia. The chairman of Task Force then was Mark Chona. Mutembo Nchito was the prosecutor and most powerful person in the arrangement. 1.Who opened this offshore account? 2. Who authorised the opening? 3. Who are the signatories to the account? 4. Is this not a case of money laundering? 5. Is this not a case of tax evasion? 6. If the Kabwes did not open this account who opened it and for what? 7. Where is the bloody money now? Check this website for a complete report on the Risk Assessment on Mr Marshal Mwansopelo Disciplinary Case at Bank of Zambia. We already have it and will be posted here anytime.